Babylonian amora of the fifth generation; born about 300; died 375; pupil of Raba and Abaye. After the death of his teachers he founded a school at Neres, a city near Sura, in which he officiated as "resh metibta," his friend and associate, R. Huna b. Joshua, acting as "resh kallah" (356-375). Papa's father seems to have been wealthy and to have enabled his son to devote himself to study (Yeb. 106a; Rashi ad loc.). Papa inherited some property from his father; and he also amassed great wealth by brewing beer, an occupation in which he was an expert (Pes. 113a; B. M. 65a). He likewise engaged in extensive and successful business undertakings (Pes. 111b), and his teacher Raba once said of him: "Happy is the righteous man who is as prosperous on earth as only the wicked usually are!" (Hor. 10b). But Papa and his partner Huna were not always overscrupulous in their business, and their teacher said to them at times: "Ye would take the coats from people's backs" (Giṭ. 73a; Ket. 85a). Papa sold his beer at a higher price than ordinary because he gave the buyer credit, although this practise was regarded as a kind of usury (B. M. 65a). He was avaricious in other ways, and frequently refused to aid the poor (B. B. 9a, 10a). As his second wife he had married the daughter of Abba Sura'ah (of Sura), with whom he does not seem to have lived happily (comp. Sanh. 14b); for she prided herself on the nobility of her ancestry as contrasted with his own. He therefore said, referring to his own experience: "Be circumspect and not hasty in marrying, and take a wife from a class of society lower than thine own" (Yeb. 63a). Papa was not a great scholar; and he lacked independence of judgment. In the case of two conflicting opinions he tried to accept both (Ber. 11b, 59b; Meg. 21b; Ḥul. 17b, 46a, 76b; Shab. 20a). He was, consequently, not greatly respected as a scholar; and R. Idi b. Abin termed him and Huna b. Joshua "dardeki" (children; Pes. 35a; Yeb. 85a). 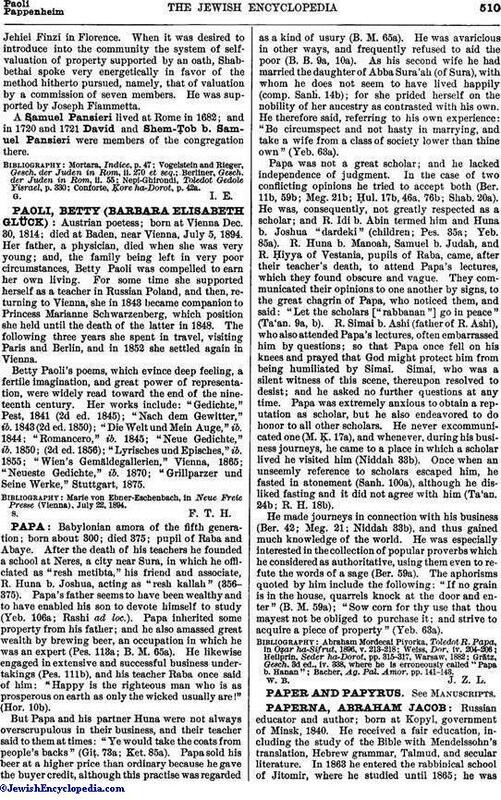 R. Huna b. Manoah, Samuel b. Judah, and R. Ḥiyya of Vestania, pupils of Raba, came, after their teacher's death, to attend Papa's lectures, which they found obscure and vague. They communicated their opinions to one another by signs, to the great chagrin of Papa, who noticed them, and said: "Let the scholars ["rabbanan"] go in peace" (Ta'an. 9a, b). R. Simai b. Ashi (father of R. Ashi), who also attended Papa's lectures, often embarrassed him by questions; so that Papa once fell on his knees and prayed that God might protect him from being humiliated by Simai. Simai, who was a silent witness of this scene, thereupon resolved to desist; and he asked no further questions at any time. Papa was extremely anxious to obtain a reputation as scholar, but he also endeavored to do honor to all other scholars. He never excommunicated one (M. Ḳ. 17a), and whenever, during his business journeys, he came to a place in which a scholar lived he visited him (Niddah 33b). Once when an unseemly reference to scholars escaped him, he fasted in atonement (Sanh. 100a), although he disliked fasting and it did not agree with him (Ta'an, 24b; R. H. 18b). He made journeys in connection with his business (Ber. 42; Meg. 21; Niddah 33b), and thus gained much knowledge of the world. He was especially interested in the collection of popular proverbs which he considered as authoritative, using them even to refute the words of a sage (Ber. 59a). The aphorisms quoted by him include the following: "If no grain is in the house, quarrels knock at the door and enter (B. M. 59a); "Sow corn for thy use that thou mayest not be obliged to purchase it; and strive to acquire a piece of property" (Yeb. 63a). Bacher, Ag. Pal. Amor. pp. 141-143.